Join plarn with slip stitch. Make a single crochet in same hole. Lay 2nd pop tab over 2nd hole of 1st pop tab, 2 single crochet stitches through both holes. 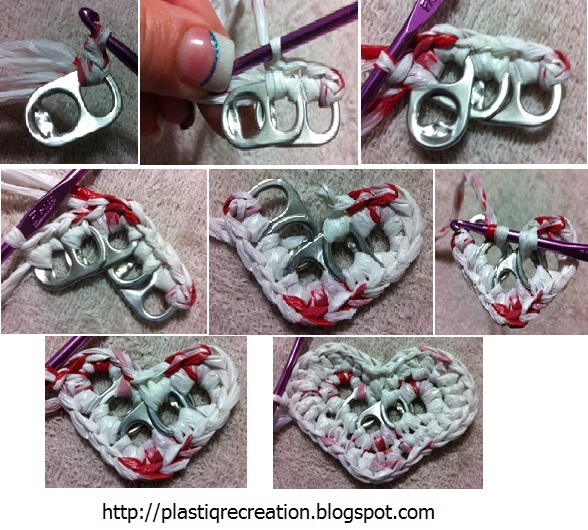 Lay 3rd pop tab over 2nd hole of 2nd pop tab, 3 single crochet stitches through both holes. Single crochet in next hole. 5 single crochet stitches in next hole to form corner. Make a single crochet stitch in next hole. In same hole, start a single crochet stitch but do not plarn over to finish the stitch, instead insert hook in next hole, plarn over and pull through, plarn over and pull through all 3 stitches on hook to complete the single crochet stitch. Single crochet in same in same hole, 3 more single crochet stitches in starting hole, join with slip stitch at top of beginning single crochet stitch. This makes a small pop tab heart. Continue the pattern to make a larger heart. Round 2: Chain 3 is 1st double crochet stitch, double crochet in same stitch, 2 double crochet in next stitch, double crochet and half double crochet in next stitch, single crochet in next 2 stitches, half double crochet in next stitch, 2 double crochet in next stitch (bottom mid point of heart), half double in next stitch, single crochet in next 2 stitches, half double and double crochet in next stitch, 2 double crochet in next 3 stitches, half double and double crochet in next stitch, single crochet in next 3 stitches, half double and double in next stitch, 2 double crochet in remaining stitch, join with slip stitch in top of beginning chain 3. For a different look, reverse single crochet around outside of heart. To make a small bow - chain 30 then slip stitch in each chain back to 1st chain made. Pull each chain strand from behind heart through each hole to front, tie to make bow. 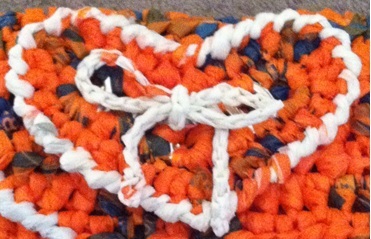 I did this one with the AT&T orange with blue letters plastic bag the telephone books come in and reversed single crochet in S&S Foods plastic bag that is white with orange/blue letters. Please don't hesitate to email me at plastiquerecreations@yahoo.com if you have any questions. This is cute! I will have to try it. Thanks for the pattern and the great pics!